A Socket Weld flange is very similar in appearance to a Slip-On flange, but the main difference is the socket weld flange is bored out match a specific pipe inside-diameter. The back side of this center opening is then counter bored to form the appropriate size socket to take the pipe outside diameter. ANSI/ASME B16.5 Class 300 Socket Weld Flanges are used in Chemical and petrochemical processing. ANSI/ASME B16.5 Class 300 Socket Weld Flanges are used in electronics. ANSI/ASME B16.5 Class 300 Socket Weld Flangess are used in processing equipment for maintaining product purity in handling foods, synthetic fibers. ANSI/ASME B16.5 Class 300 Socket Weld Flanges are used in marine and offshore engineering. ANSI/ASME B16.5 Class 300 Socket Weld Flanges are highly resistant to various reducing chemicals. ANSI/ASME B16.5 Class 300 Socket Weld Flanges are excellent resistance to caustic alkalies. ANSI/ASME B16.5 Class 300 Socket Weld Flanges are high electrical conductivity. ANSI/ASME B16.5 Class 300 Socket Weld Flanges are excellent corrosion resistance to distilled and natural waters. ANSI/ASME B16.5 Class 300 Socket Weld Flanges are resistance to neutral and alkaline salt solutions. ANSI/ASME B16.5 Class 300 Socket Weld Flanges are excellent resistance to dry fluorine. 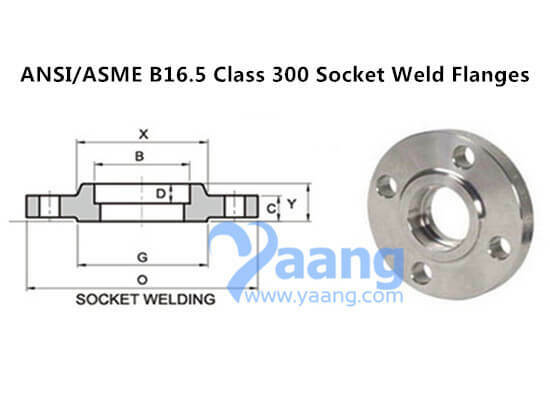 ANSI/ASME B16.5 Class 300 Socket Weld Flanges are widely used to handle caustic soda. ANSI/ASME B16.5 Class 300 Socket Weld Flanges are good thermal, electrical and magnetostrictive properties. ANSI/ASME B16.5 Class 300 Socket Weld Flanges offer some resistance to hydrochloric and sulfuric acids at modest temperatures and concentrations. 5" 125 279. 5 35.1 177.8 185.7 50.8 143. 8 235 22.4 8 3/4"
6" 150 317. 5 36.6 206.2 215.9 52.3 170. 7 269.7 22.4 12 3/4"
8" 200 381. 0 41.1 260.4 269.7 62 221. 5 330.2 25.4 12 7/8"
10" 250 444. 5 47.8 320.5 323.9 66.5 276. 4 387.4 28.4 16 1"
12" 300 520. 5 50.8 374.7 381 73.2 327. 2 450.9 31.8 16 1 1/8"
14" 350 584. 0 53.8 425.5 412.8 76.2 359. 2 514..4 31.8 20 1 1/8"
16" 400 647. 5 57.2 482.6 469.9 82.6 410. 5 571.5 35.1 20 1 1/4"
18" 450 711. 0 60.5 533.4 533.4 88.9 461. 8 628.7 35.1 24 1 1/4"
20" 500 774. 5 63.5 587.2 584.2 95.3 513. 1 685.8 35.1 24 1 1/4"
24" 600 914. 5 69.9 701.5 692.2 106. 4 616. 0 812.8 41.1 24 1 1/2"